Podington airfield in North Bedfordshire was originally built in 1940/41 to accommodate two RAF bomber squadrons but as the war progressed it became home to the 92nd Bomber Group of the USAAF. 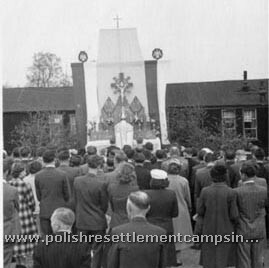 In 1946 the War Department handed over part of the domestic site to the Polish Resettlement Corps and the 3rd. Carpathian Regiment of anti-aircraft Artillery .moved in. 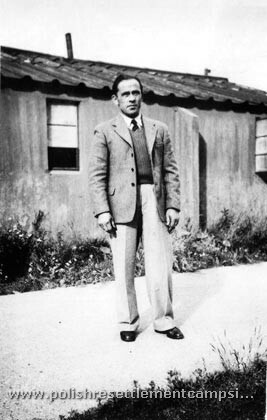 After Demobilization the camp became home to their families arriving as Displaced Persons from Africa, India and Europe. 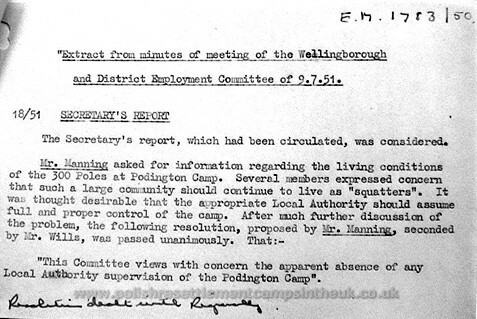 Podington camp had a unique status, the MOD had no experience in running civilian camps and the National Assistance Board, which administrated other civilian camps throughout the U.K., would not take over the running of Podington from the military authorities because of the substandard condition of the huts. These, built from plaster board and wood covered with ash felt and asbestos roofs, were considered to be inadequate for living in, there were also some metal corrugated nissen huts and the amenities were spars and had to be shared. 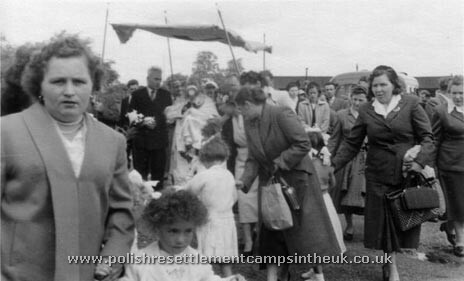 There were a number domestic sites on the abandoned airfield and Polish families started to colonised the domestic accommodation on the admin site, establishing the foundation of a future settlement. Part of Podington Domestic Sites. 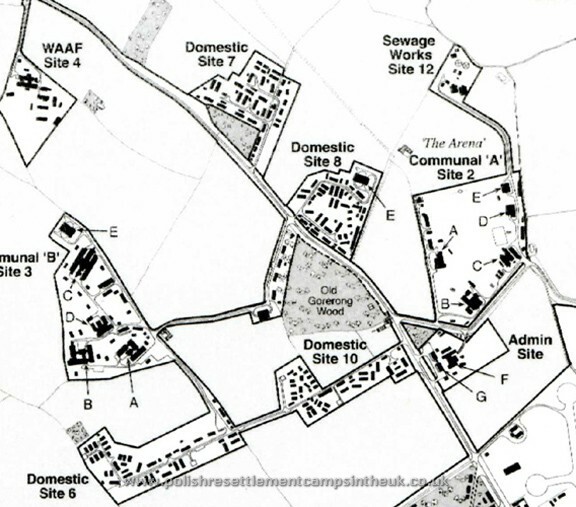 As the NAB declined to run the camp and the MOD, although technically the landlords, were not interested, so no rents were collected. Employment in the area was readily available so it was no wonder the camp quickly filled to capacity. 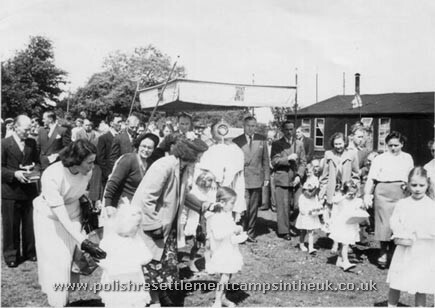 In no time the huts were renovated by the inhabitants and gardens were established growing flowers and vegetables, changing the aspect of a military camp to a typical Polish village. Podington was left to it's own devices. The residents placed the administration of the camp /hostel in the hands of a self elected "parish" headed by an elected chairman. 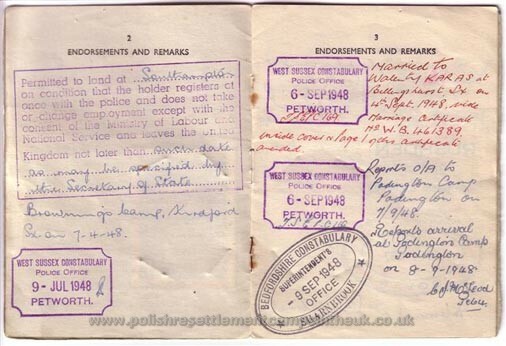 This did not please the local authority of Wellingborough, regarding the Poles as "Squatters". 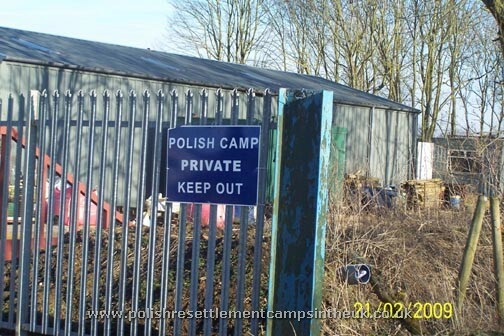 The MOD was under pressure to close down the camp, but no local authority was willing to re-house the Poles. 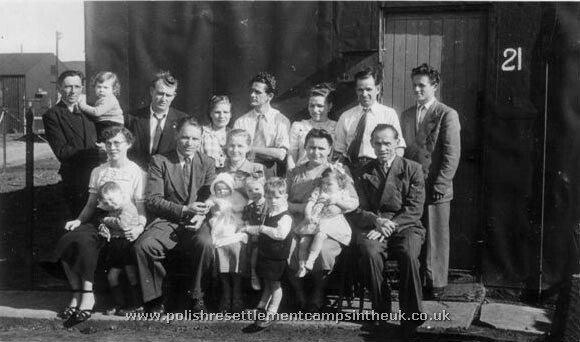 Despite the uncertainties and the constant threats of closure it did not deter the residents from living as normal a life as possible, they had survived worse times. 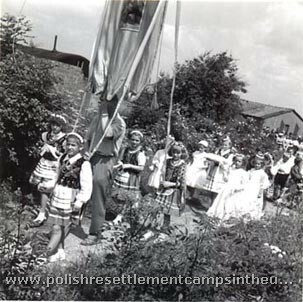 Finding strength in their faith, hard work and culture the "Polish Village" continued until 1956/7. 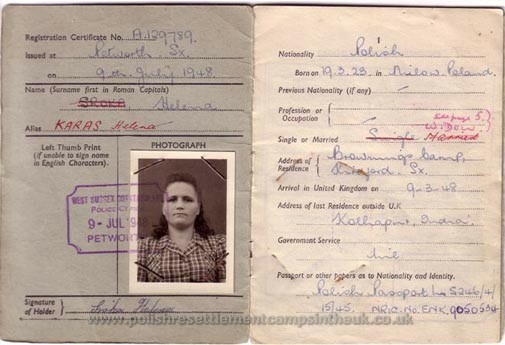 This is Helena Sroka's ID card she arrived in England from a Camp in India on board the MV Dorsetshire on 9th of March 1948. 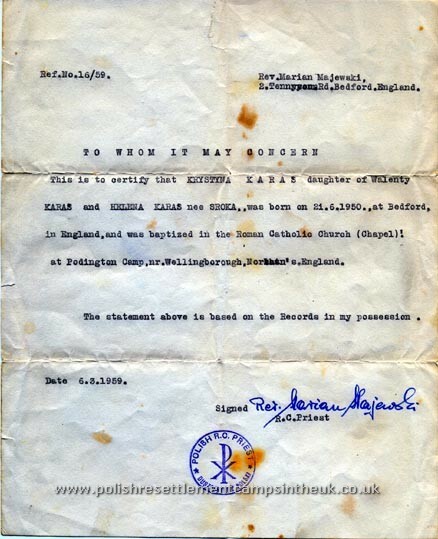 The document states she married Walenty Karaś on 4th September that year and moved to Podington camp. 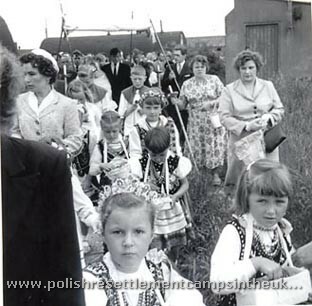 A few days later the family set up home there and had their children Krystyna and Adam. The Karaś and Sroka family at my brothers christening. My father Walenty Karaś by one of the huts. 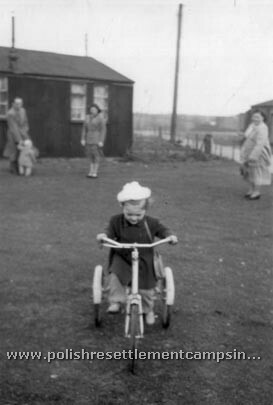 Left;- Krystyna on her trike with the camp's shop in the background. 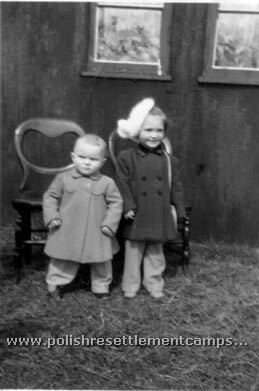 Right;- Krystyna with her brother Adam. A friend of the family Mikołaj Galan with, Elżbieta his daughter. Against the backdrop of a hut and garden. 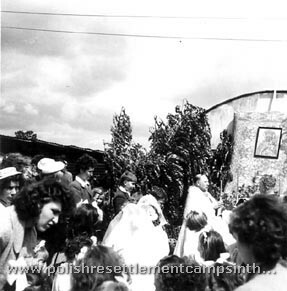 My memories are mostly of playing in the old air raid shelters and having to walk to the toilet block, and of course the religious ceremonies and Mass. 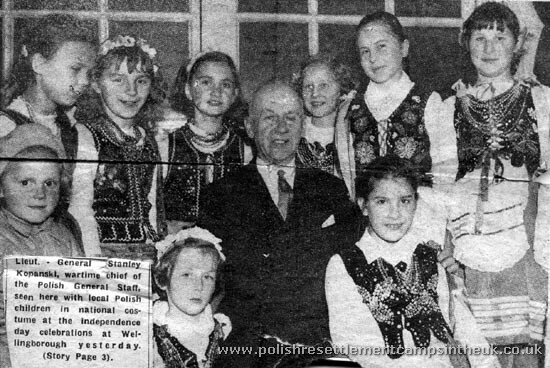 We had a small Polish church and shop but no school, hospital or entertainment hall. the priests name was fr. Marian Majewski who married my parents, baptised me and my brother and married my husband an me. I also remember going potato picking with Mum at the back of the camp. 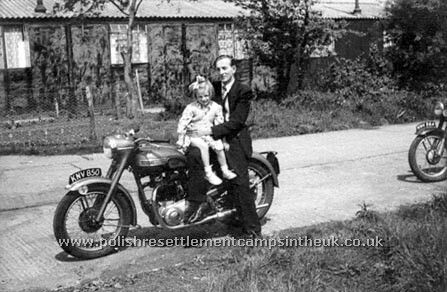 We left the camp when I was about 7 years old (1957) so the memories have faded . My mother Helena and me, just look at the hair! What ever camp you went to Corpus Christi Processions all looked the same, just the venues and people were different. 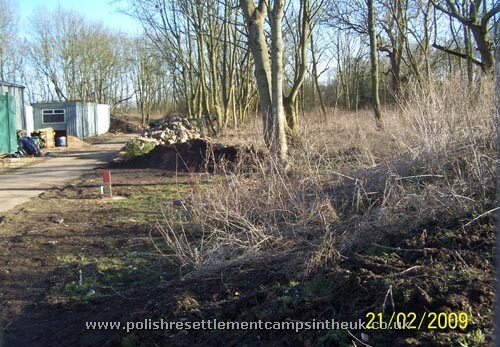 What is left of the camp today.